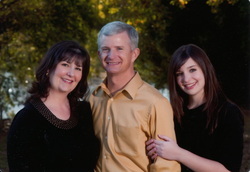 _Travis Brice has been the Pastor of Lighthouse Baptist Church since February of 2005. He and his wife Angela grew up in New Iberia and attended Temple Baptist Church for more than 20 years under the preaching of Pastor Harlan Gott (Bro. Gott). They both graduated from Acadian Baptist College in 1991 with degrees in secondary education. They were married in 1990 and have one daughter, Macy. Macy currently attends Crown College of the Bible in Powell, Tn.